… a New England winter, especially if you’re a Southern transplant. I hear from friends in Virginia who say they’re still raking leaves in their yards. Our leaves in New Hampshire are hidden under 6″ of snow and ice. It seems the weatherman predicts Wintry Weather every other day around here. That means a little snow, rain, and sleet all at once combined with cold and blustery wind gusts. With these meteorological conditions, it’s easy to catch the dreaded Cabin Fever. Some of our new acquaintances have kindly suggested a few of their favorite pastimes to get us out of the house. 10. Learn to ice skate on the pond out back. Not a chance. 9. Take up downhill skiing. Our bones are too brittle. 7. Snowshoeing. This looks favorable. We see folks our age out there. 6. Jogging. Not on your life. Black ice is rampant. 5. Skijoring. Have you ever heard of it? Skijoring is Norwegian for ski driving and it’s really gaining in popularity. 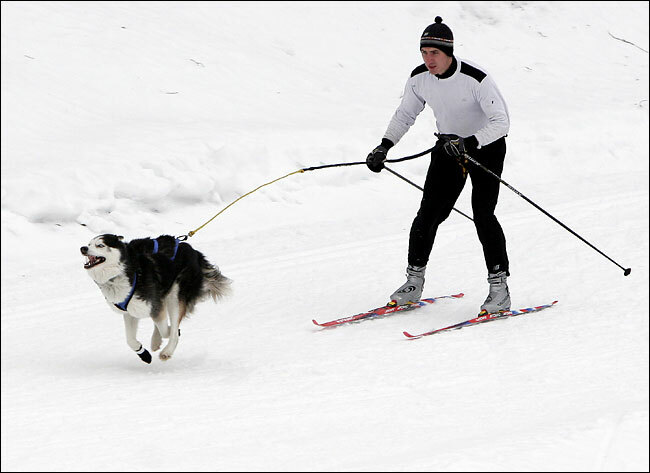 Think of it as a cross between dog mushing and cross-country skiing. But not for us. We don’t have a death wish. 3. Exploring the area. Yes! Especially in a warm automobile with a GPS. Suggestions are sounding better. 2. Shopping. Portsmouth’s Market Street, voted one of New England’s Best Shopping Streets by Travel and Leisure Magazine. Now we’re talking! 1. Eating Out. Eureka! Our #1 favorite winter pastime so far is checking out area restaurants. And I’m happy to say we’re getting quite skilled at it. Restaurants are plentiful and varied. We’re having a great time wading through menus in different hamlets. The added bonus is a bit of personal insulation around the waistline to keep us warmer when the Wintry Weather hits.